SAN ANTONIO, Texas (May 30, 2018) – Winning a single event and having your name in the headlines is the goal of every angler who has ever held a rod and reel in their hands. To sustain that type of success for a full season, is a dream come true. The true pinnacle of the sport, the Cabela’s School of the Year presented by Abu Garcia is what each and every school is competing for starting at the beginning of the season. The Association of Collegiate Anglers manages the multifaceted Cabela’s School of the Year presented by Abu Garcia. The program has been built to reward and recognize teams that compete on the water in numerous national level trails. Designed to truly crown a school of the year champion based on performance, the winner of this title has earned the opportunity to be called the best of the best. The winner of the 2018 Cabela’s School of the Year presented by Abu Garcia is Bethel University. Running away with the title in a dominating fashion, Bethel University proved they are the best of the best for the 2017- 2018 school year. “The Lord has blessed us. We’ve been able to recruit throughout the year some really great student anglers. These guys work hard all year long. Not just when they’re on the water, but both when they’re off the water and on the water. It’s just a blessing to get to come to these tournaments and do well,” says coach Garry Mason. 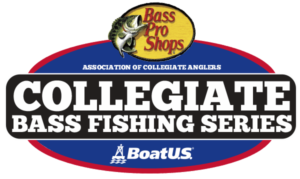 The journey to the top began around this time last year, and culminated with a great performance at the 2018 BoatUS Collegiate Bass Fishing Championship presented by Cabela’s. To earn a year long title like the Cabela’s School of the Year presented by Abu Garcia, it takes a true team effort. Coach Mason says the team has had their sites set on this title since the fall, “We sat down with our guys at the first of fall, when they got there, and we said ok guys we’re setting our sites on school of the year. To me, this is the most prestigious award that any college team or program can win.” Throughout a full school year, a variety of circumstances can occur that cause people to miss tournaments, boat problems can occur, and even weather can play a factor. For a team to pull out the title, everything must go right with a little bit of luck mixed in. Bethel University’s team produced for them from top to bottom for the full year. “We’ve stayed consistent and we’ve done it with a lot of anglers, not just one or two. So our program is really deep and we’ve got a lot of really good anglers,” says Coach Mason. At the first ACA event of the year, the Texas Lunker Challenge presented by Mossy Oak Elements, Bethel University began their charge for first place overall. Dax Ewart and Tyler Black were the top two finishers for Bethel University in this big bass format event. Ewart finished 10th place overall with 6.01 pounds, and Black claimed 20th with 4.60 pounds. Their efforts at Sam Rayburn Reservoir earned the school a total of 860 points. 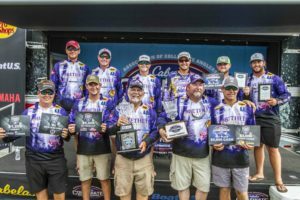 Bethel University left southeast Texas with the lead in the Cabela’s School of the Year presented by Abu Garcia, and the team never looked back. In Kentucky at the Cabela’s Collegiate Big Bass Bash presented by Berkley, Bethel added to their lead even more. This stop offered another opportunity for double points, and the hometown team capitalized on this chance. Brian Pahl weighed in a 9.22 pound fish to win Day One Session Four, and took the overall top spot for the event. Fellow teammate Ricky Harris also brought in a fish over the seven pound mark. Weighing in with 7.42 pounds, Harris claimed fifth place overall. Up to this point in the season, this was by far the most impressive performance by any one team in a given event. Bethel University left Paris, TN with 980 more points to go towards their yearly total. At this point, their lead stretched to more than 600 points over the nearest competitor. Bethel University’s success was not secluded to just ACA events. Fishing other major national trails, teams representing Bethel finished in the top five at seven of the 12 other tournaments they fished. At the championship events for both FLW and B.A.S.S college tournament series, Bethel teams finished third and second respectively. Of the seven top five finishes, the school managed to win one of those events. At Lake Seminole back in February, Cole Floyd and Carter McNeil won an FLW Southeastern Regional. 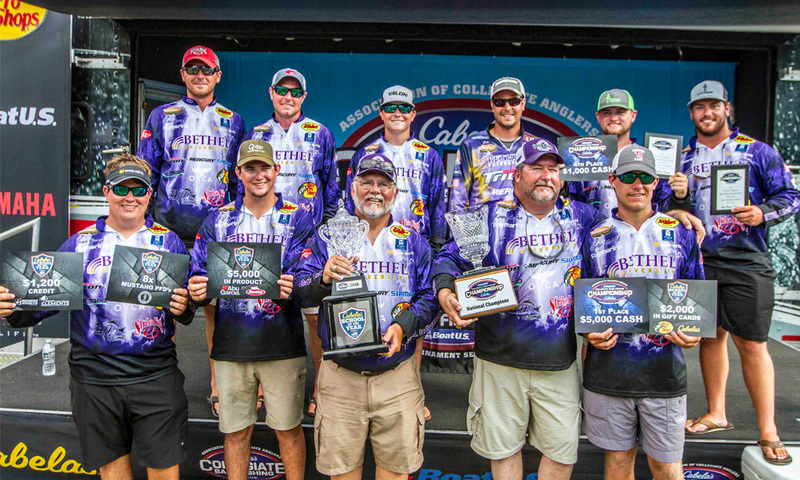 As the year progressed, Bethel’s dominance became aparent as all signs pointed towards Florence, AL and the 2018 BoatUS Collegiate Bass Fishing Championship presented by Cabela’s, where a SOY champion would be crowned. Just as soon as one year comes to an end, another begins. Members of the Bethel University fishing team immediately left Florence, AL to make their way to the next tournament on their schedule. The chase to be the best school in the sport never stops. Following the trophy ceremony at the championship, Coach Mason and staff have already turned their focus to the 2018-2019 season in hopes of repeating this accomplishment, “We’re going after this just as hard as we can go after it again next year.” Once the first tournament is in the books, the new standings will be released for the Cabela’s School of the Year presented by Abu Garcia. The final Top 10 for the 2018 Cabela’s School of the Year presented by Abu Garcia is full of teams from all different parts of the country. From Michigan, to Texas, Illinois, and all the way down to Alabama, schools from all regions of the United States are represented. This speaks to just how well rounded the anglers are who compete for these various schools. In many cases, when these competitors show up to lakes in areas outside of their home states, it is the first time they have seen that particular body of water. 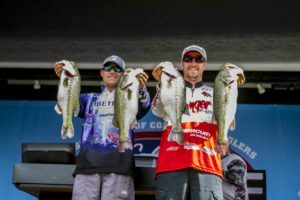 For instance, the 2018 Texas Lunker Challenge presented by Mossy Oak Elements marks the first time the ACA has held an event on Sam Rayburn Reservoir. When the trail took a turn north in March to fish in Paris, TN, anglers were met with a different Kentucky Lake than they had become accustomed to. Lake levels were more than 10 feet above normal, and conditions were changing daily. All 10 of the teams represented in the Top 10 can hold their heads high knowing they went toe to toe with the best in the sport, on some of the most challenging bodies of water, and earned their respective ranking with hard work and determination. Ending the year in second place is the University of North Alabama located in the city of Florence. Triston Crowder and Lake Blasingame helped to cap off this great year with a third place finish at last week’s championship. Although UNA did not win a single event, they put together quality finishes at every stop. 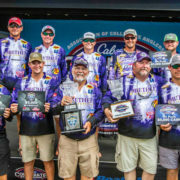 Year in and year out, the University of North Alabama finishes high in the standings for the Cabela’s School of the Year presented by Abu Garcia. Being located in Florence, AL near Pickwick Lake, members of the UNA team get the opportunity to fish 12 months out of the year and hone their craft on one of the most diverse fisheries in the country. Another team loaded with quality anglers located near another top fishery is Murray State University out of Kentucky. Finishing third place overall in the Cabela’s School of the year presented by Abu Garcia, Murray State sits just miles from the shores of Kentucky Lake. Because of this, the club was able to take advantage of some of the unique ways offered by the ACA to earn points. Murray State University hosted two separate events throughout the year which earned them an extra 20 points towards their team total. During the season, Murray State capitalized on the double points events offered through the ACA. At Sam Rayburn, the team earned a total of 826 points, and at the Big Bass Bash on their home lake they earned 925 points. The 2018 season marks Murray State’s highest finish in the Cabela’s School of the Year presented by Abu Garcia. For a look at the complete 2018 standings, click here.